Agreed. I think y'all jumped the gun there. This update was awesome!! So these are all Mogul buildings? Nathan did a really good job on the designs, so intricate! No, these are landmarks, things needed for missions and such. Ah gotcha, now looking at the title I realize I'm just a dummy. Nathan does both but this is just the Landmarks. Well if these are any indication, the Mogul buildings are going to look great! With no travel powers active. "Took the stairs. All of them." Having trouble posting on the site, so I've linked the KS update in the OP. Loving this update. The more you tell us about the City, the more I get a feel for our new home. I really like the fact that it already seems less generic than our old city. Also, as always, I really appreciate the extra notes telling us what details to look for, or in this case what *not* to focus on. I really dig the noticeable differences in architecture. Good stuff. Keep'em coming! Aww, nuts. I was hoping the Library of Alexandria would be Neo-classical, with a columned portico. My fav is the seedy bar with seedier back rooms. A great place for my villain, Mr Easy to hang out. Hot diggity this was exactly the kind of update I wanted to see: something about assets that will be rendered in game! Also I am anticipating whiling away many an hour in the Library as I read up on new spells! These are interesting designs but they kind of look outdated. I get the feel of 70's and 80's. Maybe its just the colors and textures that will look completely different after being rendered but the shapes and structure just looks a bit old to me. Remember, though, that the buildings are representative of the era in which they were built. There should be some buildings that have a decidedly dated appearance because they're maybe 100 years old or whatever. Then there should be some that are more mid-20th century, perhaps rebuilds or building 'facelifts', and more modern and even futuristic buildings in certain areas. If they all looked modern, it wouldn't really represent a real world location. Why not? Its a game. They can just say the whole city got a remodel and who would question it? That is not the lore of the city, though. I don't think this is the point in game development to change all of that. I'm trying to understand why you'd want this. No real city looks like that. Buildings are persistent and non-modern buildings are ubiquitous. If you want an all-future looking setting Valiance and SoH are going to have that. One of the things I love about CoT is that there will be a contemporary setting with a deep sense of history. I mean some of the building designs look older than the COH buildings. Maybe after waiting so long for a successor I have higher expectations. I just don't really see these buildings as exciting or something Id wanna walk by in game or as a hang out spot with other players. I think the creator has real skills and talent but the design aspect is not my taste. Not everyone is going to love everything COT creates you know. I still appreciate the update, and the effort going into these landmarks. Wait, do you mean the graphic rendering? I thought you meant the architectural design. This isn't the level of graphics that will actually be in the game. The actual graphic rendering--texture and such--should be much, much higher. I am referring to the architectural design. What is the third building in the Pharos Firehouse group? Looks a bit like a parking garage, except all of the levels have stairs. It's a tower structure that firefighters use for training purposes. I don't off-hand know the NAME of it, but I know roughly what purpose it serves. The whole point of the different districts is to value everyones* tastes. There will be a futuristic tech district where you can hang out, and there will be an area where I can hang out which are more my taste. Just cause you don’t see it in this update, doesn’t mean it won’t be there at all. I really like that the city will have a good mix of old and new. It's actually a pet peeve of mine when games use a standard blanket architectural style for all buildings (Looking at YOU ESO). Cities DON'T WORK LIKE THAT. They're built up over time and reflect the different eras and influences of the people who designed them. They aren't uniform at all, and they don't have any sort of overarching style (with certain exceptions). Well, unless the city in question has been razed to the ground and was since rebuilt. The first city that popped into my mind as having a uniform style was Brasilia, which makes sense given that it wasn't even founded till the 1960s. Titan City is New England, though. And New England's pretty famous for it's old buildings. If the Devs weren't going to make it feel like a New England city, then there was little point in bothering to specify where it was. For a much later date, obviously. Well, even consider a city like Chicago that burned to the ground during the Great Fire. Only four pre-fire buildings exist today. In the aftermath they had an entire city to rebuild and they used it as an excuse to try new things and new styles that hadn't been done before. Of course since then Chicago has had many different eras of buildings. I highly recommend the architectural boat tour if you plan to visit. Wasn't early Chicago partially in a swamp, so they put the entrance on the second floor in anticipation of the houses sinking into the ground? The Beacon and Thunderbolt seem to have particularly fitting exterior designs - will want to check out the bar's interior as it seems to have good potential for a confusing (in a good way) mission map and interesting setting for seedy missions. The Library's wings do appear much flatter around the roofline and between the main wall surfaces and corner towers than I would expect even after mentally accounting for the update's "what to ignore" plus my own judgements of the angle of view, simplified lighting in the editor. That said, I would tend to imagine a real building in this style would have significant corbelling to extend the roof beyond the walls, and ways to "interrupt" the brick walls' flatness with some degree of both physical displacement of the towers and brick pattern/color changes (such as stone quoins, commonly seen as lighter and larger stones at the corners on a building of primarily small red bricks). Hopefully those sort of slight details end up in game. Extending the "window wall" of the wings further outward from the towers, and replacing one of the floor's windows with bays could create more visible displacement and variety, for example. Even some "bricked up" windows on the wings' back walls might work if the building has been repurposed to protect the book stacks there. The tops of the towers are nicely distinct. Perhaps this will turn out to be one of those structures that looks friendly/foreboding at different times of the day/night cycle. I hope that the fire stations (and HQ) have some variety in size and design to match their neighborhood, as the police stations did in CoH. I do like the twin antennae and the bracing on the side walls. Maybe I'm wrong, but the pictured station appears to be the best fit as a medium-size local station purely for Alexandria, while a headquarters for a reasonably-large city would require much more floor space to manage the likely thousands of employees citywide and hefty amount of communication required to coordinate firefighting, rescue work, and EMT efforts...despite (or maybe *because* of) our help. What happens when laser eyes miss, after all? The training site is a good inclusion. The Tech museum - I wonder if some of its more...uh...garish...features will be lit differently, to produce a theater-like, showy or neon look? Those are some unusual building colors (perhaps just temporary, though), and the surroundings will determine how well it meshes with the city - if it's really meant to mesh at all. Maybe the lore calls for it to seem like an icon of a much earlier age, no longer in tune with the district around it. Hmm. Piers (maybe?) on the Holt House make me wonder about its location. It does evoke a sort of waterfront feeling from its style. Is/was the Library district in danger of flooding, or is this just an illusion from the texture of the foundation wall? I just don't really see these buildings as exciting or something Id wanna walk by in game or as a hang out spot with other players. I think the creator has real skills and talent but the design aspect is not my taste. I find this interesting. I get where you're coming from, because I personally don't like some of these buildings. I like some. But not all. Thing is, the way I see it... it's not about what I like, it's about what seems realistic and contributes best to the Titans setting. Back in CoH, a lot of the older zones looked more or less the same. And that was awful. Newer zones were fine, they had their own look. But older ones were very cookie-cutter, visually. The Titans team seem to be taking a lot of care with creating background lore for each district and each neighbourhood. And this update proves that a senior 3D artist is executing that vision by taking the time to mimic different architectural styles. That means an older feel for some areas. It means having buildings that look as though they come from a certain time period. That's important to me. As others in the thread have said, it suggests there's real history and background to the place. To me, that's more important than whether I, personally, like a particular look. Other areas of the city will surely have iconic buildings that look considerably more modern, if that's what you're into. The lore docs we've seen already suggest that, plus the Mogul backers have demanded buildings with all sorts of different aesthetics. I get the impression that Titan City itself is going to be treated as a major character. This makes sense. In every other MMO we play, the game world is divided in to a bunch of biomes, each with its own memorable flavor and aesthetic. It looks like MWM is going to be doing the same thing with Titan City. I'm looking forward to cruising around and discovering all the little bits and nuances of character that the city's neighborhoods have to offer. Like Acyl said, these landmarks give the place a history; they give it character. And character is what I want in Titan City. Well said Huck, I couldn't agree more! "It looks like we're in the teens...somewhere." "OK. When we get to twenty, tell me. I'm gonna throw up." This make me happy. I think cominations of old history building and new building make the city seem more real. The Chicago swamp thing reminds me of Ankh-Morpork from Discworld. Thanks to regular flooding of the river Ankh most of what Ankh-Morpork is built on is Ankh-Morpork. This is the administrative home-turf of the Titan City Fire Department, and home of the local fire station. In addition to the basic offices of the Chief and other administrators, there are also training classrooms, and a flame-shaped beacon standing atop the tip of the tower. This beacon changes color as a weather alert system; on the rare occasions that the beacon is flashing, it is seen by the heroes of the city as a call to arms for some sort of large and dangerous event. A three-story (except for the beacon) structure covering most of a city block, the fire station serves the Alexandria District as well as contains the headquarters and central offices of the Titan City Fire Department. Okay, if these buildings lacks these things, someone needs to go into the editor and FIX THAT omission(!). Shhh...not supposed to talk about land sharks. That cat/fire pole thing reminds me of a similar feature in the famous Amerikatt tower. I have a sneaking suspicion that Holt House will be haunted. If it is, I'll say "I told you so!" If it's not, everyone will have forgotten this post by then. The tech museum seems like a great idea. But it begs the question, is it inactive, display-only versions of the technology, or active? I'm guessing active, just because it would explain villains constantly trying to break in and steal tech. "What? Why don't we gut the tech and just have a video of what it can do playing beside it?" "Well, if it's not active, we won't get attacked. If we don't get attacked, we don't make the news. Then, we get less foot traffic and donations." The Central Library is a large, imposing gothic structure which houses a rich and diverse public library, as well as some secrets. It was built in 1886 and was the only building in Alexandria to survive the 1908 fire. Originally conceived of by Nikolaus the Bloodied as his own personal cache of forbidden magic, Arcane Sentinel mystics usurped the construction project and sealed Nikolaus out via complicated wards. Sentinel mystics occupy and run the building to this day, guarding the cache from the grasp of evil. The Central Library serves as a source of mystic information for players. The building is heavily warded against evil magic, and makes a perfect target for power-hungry mages or demons concocting plans to get at the secrets within. Anyone with a last name of "the Bloodied" is bound to have a few ghosts lurking around their home. Something similar (though likely on a much smaller scale) happened in my hometown Sacramento, CA which sits at the meeting point of the Sacramento and American rivers (from which the city takes it's nickname, The River City). Before the levee system was built, it used to flood frequently, this eventually lead to them raising street level up a floor and filling in the ground in the area. The only place you can really find evidence of this is in Old Sacramento, where there are still numerous tunnels and the like still remaining. They give guided tours of them these days. Most of those buildings are really nice. Glad to see you showing us some distinctive buildings in Titan City. I like the Medieval-ish style of the Central Library, looks like it could be an interesting place to hang out. Those towers over the entrance are great Super Roosting spots. I can see this Library being a creepy place at night or on Halloween. The Vander Vere Museum I also like. The rest of them I'm not sure about, I guess I'll have to see them in game before judging them. I would actually love to see one or two buildings have gargoyles. I love that style. Now I want to make a pigeon themed hero and call him Flying-Ratman. I can pick whatever emanation point I want, right? The same thing was done with downtown Seattle after a fire, both to raise the city so it wouldn't flood regularly and so that the toilets wouldn't backflow at high tide. The city was raised one or two floors, depending on where it was, and like Sacramento, there are guided tours of the Seattle Underground. I really like that the buildings have different architectural styles. That's what a real city is like: An ornate Victorian apartment building next to a sleek glass skyscraper next to an imposing Brutalist government building. I know that every building can't be unique. But it will be great seeing these studded around our neighborhoods. 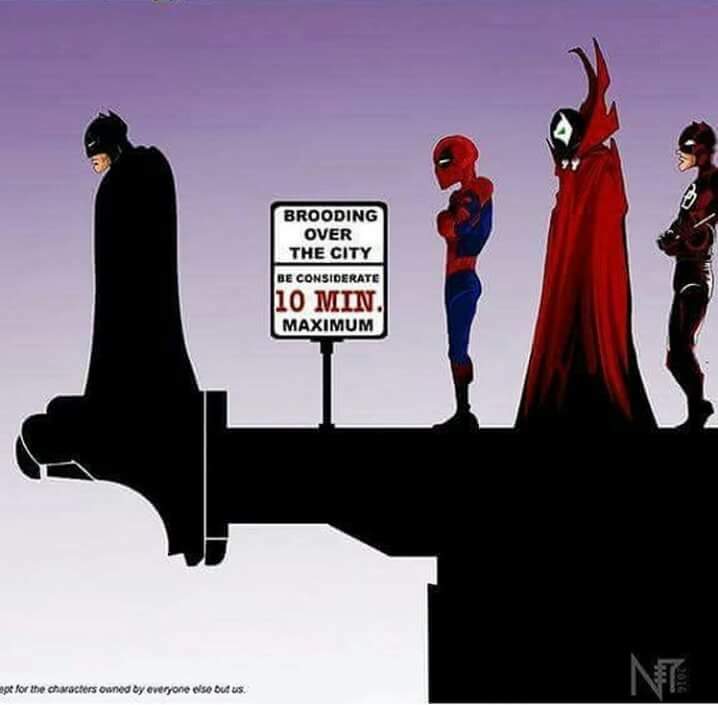 Yeah, but we need one of these signs up there, too, for fair use of the gargoyle perches. Here's a bit of architectural trivia for ya: the word 'gargoyle' technically applies only to a sculpture on a building that channels rainwater away from the roof, usually with a hole through the centre so that the water comes out of the creature's mouth. * The ones in the clip immediately above look like they are probably gargoyles. But the monstrous sculptures that are just sitting on the roof to scare away evil spirits are actually called grotesques. Apparently the word 'gargoyle' is a French onomatopoeia for the gurgling sound of the water. And that's where we get the word to 'gargle'. I Just found a picture of it on Pintrest, and It's as bad as I thought It would be. Next time I'll just take your word for it and stab my curiosity before it pollutes my mind. :-) I think it doesn't look quite so bad in person, but maybe that's just cuz my eyesight at that distance doesn't capture all the detail of a close-up photo. I remember the first time I saw it, I thought, "Is that...? Noooo...."
Arrow slits in castles had similar alternative uses. Slightly different: In the case of Seattle, the buldings destroyed by fire were rebuilt with two entrances, one (for temporary use) on the ground floor, and another on an upper floor (mostly the second, but a few might have been on the third). Then the streets were raised (by building walls along the curbs and filling in the middle). New sidewalks were made by laying beam between the street 'walls' and the sides of the buildings. It would have been simpler to just fill in the whole area and build normal buildings and streets on it, but doing it this way let them get the city in operable condition faster, even if they had to put up with weird halfway configurations of things while the street-raising was going on. This is the famous "Seattle Underground Tour", that takes tourists through some of the old, covered sidewalks on the pre-fire ground level. I had that pole installed for Kitty Softpaws, the original pole cat!